The Stones perform on their 1972 tour, which is documented in this remastered concert film. As guests at last week's preview cinema screening of the forthcoming DVD release of Ladies And Gentlemen... The Rolling Stones surrounded the bar before the lights dimmed, a few were taken aback at being asked to pay for their drinks. "That's Mick Jagger for you," one was overheard to remark. "You can take the boy out of the LSE, but you can't take the LSE out of the boy." It appeared to be a good-natured dig, not deriding the singer for any perceived meanness, but more a light-hearted acknowledgement of his well-documented fiscal savvy and business acumen. And it's that aspect of Jagger's character, a man who's always kept at least one eye on the bottom line, that arguably informs the return of this remarkable concert movie. On its release in May, the digitally remastered and expanded edition of Exile On Main St became only the second reissue title this century to top the UK album charts (the first was The Traveling Wilburys). Clearly, it's a period in the Stones' lengthy history that's still capable of creating a stir, so it would make sound financial sense to see what else is languishing in the vaults from the same time. What's initially baffling about Ladies And Gentlemen... is the fact that it's not been seen for so long. Filmed over four nights in Texas on the Exile tour of 1972, it was given a limited theatrical run in the US two years later, briefly turned up on VHS in Australia in the late '80s, and then disappeared. But this is no misfiring folly needing to be swept under the carpet; it's the Stones on stage at their most electrifying. The camera work is not the greatest, certainly not when held up to the ambition of Martin Scorsese and Shine A Light, but the limitations of what appear to be just two or three hand-helds either near to or on the stage manages to place us at the heart of the action. It's almost as if the viewer is a roadie crouched in the wings or by the monitors, waiting to rush towards Keith Richards or Mick Taylor with replacements for broken strings. Watch the Ladies And Gentlemen... trailer. Apologies for the somewhat cheesy voice-over. It becomes clear very quickly that this was a movie made without the planning or eye for continuity that a director like Scorsese would insist upon. 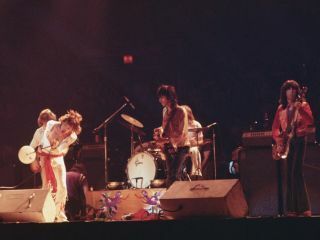 The Stones wear entirely different stage gear for each of the four concerts, but the sight of Jagger in, say, a blue jump suit during Gimme Shelter followed by a blousy white number for Dead Flowers doesn't distract from the joy of watching the greatest rock 'n' roll band in the world go through their paces. If anything, it adds to the overall sense of a busy touring band rushing from one triumph to another at the height of their powers. Although the concerts coincided with the release of Exile, only four tracks from the album feature in the 15-song set of the film - pretty much the same four that still get regular airings at modern-day Stones gigs. Elsewhere, it's solid gold classics all the way, from the stripped-down You Can't Always Get What You Want (shorn of the gospel pretensions of the recorded version) to the menacing strut of Midnight Rambler. It all gets a little shabby on the cover of Chuck Berry's Bye Bye Johnny, but it's a charming insight into the band's ramshackle R&B roots, compared to the clinical precision of their 21st century shows. Ladies And Gentlemen... The Rolling Stones is released on Eagle Rock DVD and Blu-ray on 11 October.